I received the following last night via email from Pit YO3JW. 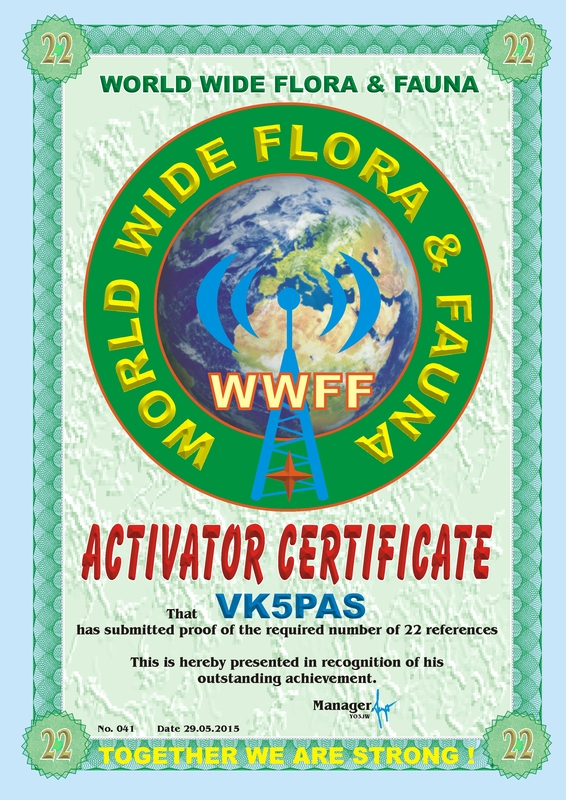 A new Activator certificate for the World Wide Flora Fauna (WWFF) program for activating a total of 22 WWFF references. Great work. What is the significance of 22? Half of 44? Enjoying a cup of coffee here and some raison toast for brekky. The first ‘global’ WWFF Activator certificate is issued when you activate 11 different WWFF references with a minimum of 44 QSOs from each. And then there are upgrades for every 11 extra confirmed references. Was meant to go to the club this morning, but just have a bit too much on. Have a good weekend mate. I’ve got quite a few of my activator logs to upload yet. Been so busy with other people’s logs, awards, etc, mine have been sitting there for a while.